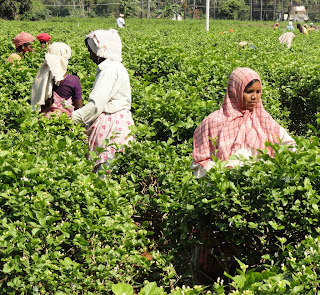 NGO News blog, NewsLine: Jasmine Perfume Industry, if established, will be a boon for Srirangam area Jasmine plantation growers. Jasmine Perfume Industry, if established, will be a boon for Srirangam area Jasmine plantation growers. Jasmine Perfume Industry, if established, will be a boon for Srirangam area Jasmine plantation growers. Jasmine is native to Himalayan valleys and certain areas of southern India, Malliampathu and certain villages in Andanallur Block of Siriangam of Trichy District women Self Help Groups cultivate Jasmine Plantation. Jasmine seedlings grow slowly, so cultivated jasmine is propagated from growing tip cuttings with several nodes and one leaf. Natural suckers can also be propagated. The cuttings are treated with a soluble salts rooting solution and rooted in equal parts of sand, vermiculite and moss. After 120 days, the cuttings are set into open-ploughed fields, growing in pits evacuated to 4 feet. The lower depth of the pit is filled with a mixture of rotted manure, sand and soil, and the upper half is filled with top soil. During the first year, the young plants are pinched to encourage bushy branching, since blooms set on both terminal and axillaries tip. Pruning begins in the second year, to eliminate suckers, old growth, basal branches, and any trailing branches and to encourage fresh shoots and increase the number of blooms. Upper branches are pruned to 4 feet above ground level. Larger commercial operations use defoliants instead of pruning. Organic manure is applied after pruning, but too much manure encourages vegetative growth over blooms. Flowers can set as early as 90 days after a cutting is rooted, but stable economic yield from jasmine begins in the third year and continues at least until the twelfth year before yield declines. If flowers are harvested for floral garlands, the closed buds are harvested during the night before market. For perfume production, fully opened flowers are harvested near dawn. Jasmine is one of the few picked flowers that continue to develop fragrance, as much as 36 hours after harvest.